The fighter jet was hit by the cannon of a second Falcon parked nearby. BAF F-16 catches fire at Florennes AB. 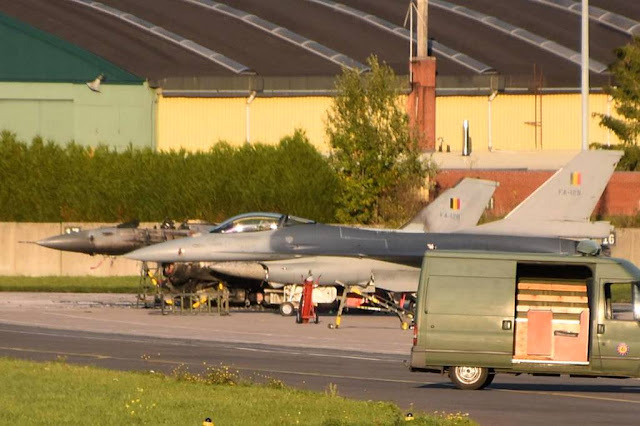 According to a Belgian MoD statement, a fire broke out at Florennes AB, Belgium, during the maintenance of an F-16AM. The accident caused the injury of two people who reported hearing problems and collateral damage to another nearby aircraft. Unofficial sources reported that the damaged aircraft was hit by the cannon of an F-16 parked in the side shelter. A technician accidentally fired a shot. The fire was quickly tamed and the area made safe thanks to the excellent work done by the rescue services. Flight activities are suspended until Friday. The ASD (Aviation Safety Directorate) has started an investigation. "The damage is very serious: the plane that caught fire was probably destroyed, and it has not yet been possible to verify the situation on site because the area is protected by mine clearance services," said Lt Col Didier Di Giovanni. Florennes AB hosts the 2nd Tactical Wing, equipped with about 20 F-16 aircraft divided into two Squadrons: 1st and 350th. Seven aircraft assigned to the Wing have just returned home after a two-week deployment at Gioia del Colle AB, Italy, to train together with Italian Eurofighters (More details here). In addition, four Florennes-based F-16s are currently deployed at the Siauliai AB to participate in the NATO Baltic Air Policing mission. The Belgian Air Force counted 54 F-16 jets before the accident.